OMEGA’s HHP-800 series handheld models are extremely versatile and cover most portable pressure measurement needs. The HHP-800 series is used for dry non-corrosive gas applications. The HHP-800/SIL is modified with a silicone protective seal for liquid applications. 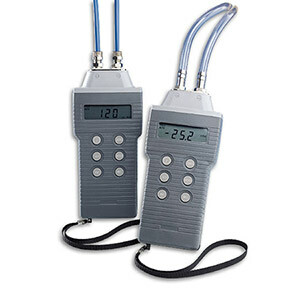 The HHP-800 can be ordered by itself or with the HHP-800-KIT for calibration applications. Media Compatibility: Dry: Clean, dry, non-corrosive gas Wet: /SIL: Limited only to those media which will not attack silicone seal. 注: Each HHP800 series meter comes with 1 m tubing, 1 / 8 " BSP connectors, 1 / 8 " NPT adaptors, battery and complete operator’s manual.